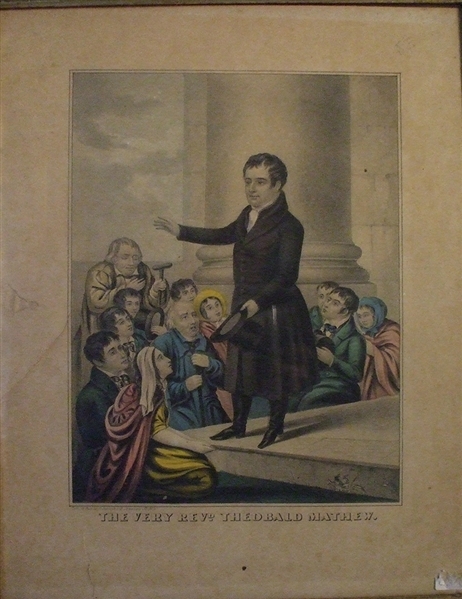 Hand-tinted engraving published by J. Bailler, New York,12’ x 17” framed, titled "The Very Revd Theobald Mathew. The margins have two minor tears not affecting the image. Overall needs a cleaning, VG. (formerly from the Rex Stark Collection.)" Mathew visited the United States in 1849, returning in 1851. While there, he found himself at the center of the Abolitionist debate. Many of his hosts, including John Hughes, the Roman Catholic Archbishop of New York, were anti-abolitionists and wanted assurances that Mathew would not stray outside his remit of battling alcohol consumption. But Mathew had signed a petition (along with 60,000 Irish people, including Daniel O'Connell) encouraging the Irish in the U.S. not to partake in slavery in 1841 during Charles Lenox Remond's tour of Ireland.